Bikers are cool, but actually riding a bicycle takes more energy or motivation than some of us have. But luckily, winter is a prime time to infiltrate the biking community and meet those fit, fun and athletic people without having to mount a saddle. Winter biking activities are a gateway into fun events, socializing and progressive ideas, so take advantage of the sub-zero temperature to warm up to the biking niche without breaking a sweat. Whether it’s visiting multifunctional bike venues like Serk or Natooke or participating in indoor events, get the social wheels rolling without chilly pedals testing your mettle. Biking while drinking is a bad idea. But taken separately, what better place to have a drink then a venue where fit people tend to congregate? Serk, discretely located in Beixinqiao, houses coffee, drinks and bikes in a streamlined, open space with high ceilings. „Biking in the winter is a big concern which is why we decided to have something other than bikes,“ said owner Shannon Bufton, who runs the space with his wife, a Beijing native. The husband and wife duo are also co-founders of Smarter than Car, an aptly named platform that favors greener alternatives. At the front is the bar and cabin-esque café; look high for the assortment of bicycles hanging above. The gear and supplies are packed efficiently in the back. Novices can peruse through biking and outdoor adventure magazines on the side shelves, while serious bikers phase in and out. For those hoping to do more than sit around and take in the scene, winter biking options are surprisingly expansive. Serk is holding a thrice-occurring indoor bike competition in December, January, and March, called JISU PK. The event has two competitors race on stationary bikes for 30-seconds, an event fueled by alcohol. For outdoor enthusiasts, the Beijing Bunch Ride is a group that rides all the way through winter. Organized by TriBeijing and Serk, the group meets early Sunday mornings at Serk, before heading out. Natooke, which customizes fixed gear bikes, has already become, well, a fixture in Wudaoying Hutong, holding many events at all times of the year. Owner Ines Brunn, originally from Germany, first visited Beijing in 2001 and witnessed first hand the progression of a city cycling culture upturned by a car society. This has fortunately shifted in the past two years, with the emergence of a younger generation of bikers. 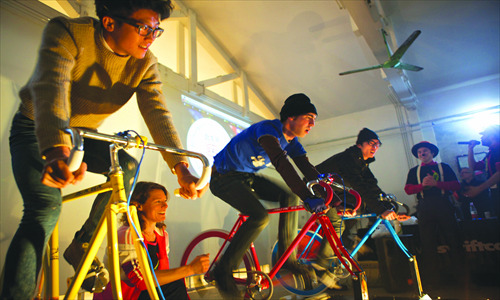 On Saturday, Natooke held a Mini Fixed Gear Revolution, a winter indoor event at Long Art Space in the 798 District that featured indoor racing and relay races. All levels of bikers were welcomed. „I thought it would be good to have a counter event to summer activities, [one] less competitive and more focused on having fun in the winter,“ said Brunn. Despite being winter, there seemed no shortage of bikers, evident from the dozen enthused, well-dressed and mostly young Chinese locals that showed up around 11 am outside the shop prior to the event to ride up together. Other events just require basic bike riding skills and a lot of zeal, including the Big Dirty ride on St. Nicholas Day, December 6, better known as the day foreigners dress like Santa and attract attention from locals. „We’ll have a costume ride, like we had for Halloween. We’ll meet here at 8 pm and find Santa costumes for people who do not have them, then we’ll ride,“ said Brunn. One obvious way to get involved is to treat the bicycle as it was intended, as a mode of green transportation. Don’t be deterred from starting now. „I’m always confused when people say, ‚I don’t cycle anymore in the winter because it’s cold,‘ and then they take the subway and walk forever. I find it much colder when you’re [waiting] for a bus or taxi for 20 minutes,“ said Brunn. Novices and experts agree on dressing well. „You can put bags over your socks, [which] stops the wind from going in,“ said Bufton, recommending sticking hot pouches (available at any convenience store) inside gloves and on top of the toes. „Always cover your ears,“ Bufton added, knowing the value of keeping warm, after his feet started to go numb a few years ago from winter riding. And unless you want to counterweigh the benefits of biking, wear a face mask to shield against pollution. Of course, not all run-of-the-mill bikers are convinced, though aesthetics play a convincing factor. „All the international kids in the area, especially Koreans, have cool looking fixed gear bikes…I’m sure that pretty bikes are a great conversation starter,“ said Theresa Tong, a 26-year-old Australian studying in Wudaokou. „But harsh wind is not my friend,“ Tong said, with no plans of using the bike as a social tool to sneak into the cool – no make that freezing cold – biking subculture. This entry was posted on Mittwoch, November 28th, 2012 at 15:55 and is filed under Beijing, China, Cycling, Green, Media. You can follow any responses to this entry through the RSS 2.0 feed. Both comments and pings are currently closed.